It's that time of year. 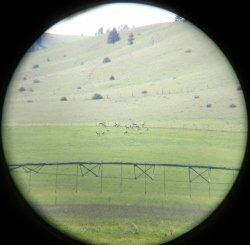 The cow elk are spending the last few weeks of their gestation period making up for slim pickings through the long, dangerous winter. There were hundreds of cows feeding in this field last night. Some decided they might as well just spend the day, since they'll be right back before nightfall. The Creator pre-programmed them to make developing healthy pre-born calves their number one priority right now. Those calves will start seeing the light of day in two are three weeks, after a full nine month gestation period. They will soon start to burn up calories from mother's milk, romping and playing to build up brand new muscles, while their mothers continue to graze with earnest to make that milk. I'd love to get some pictures of those calves in this field, but you have to be quick, as they often bring them out here only minutes before darkness falls and take them out at dawn. 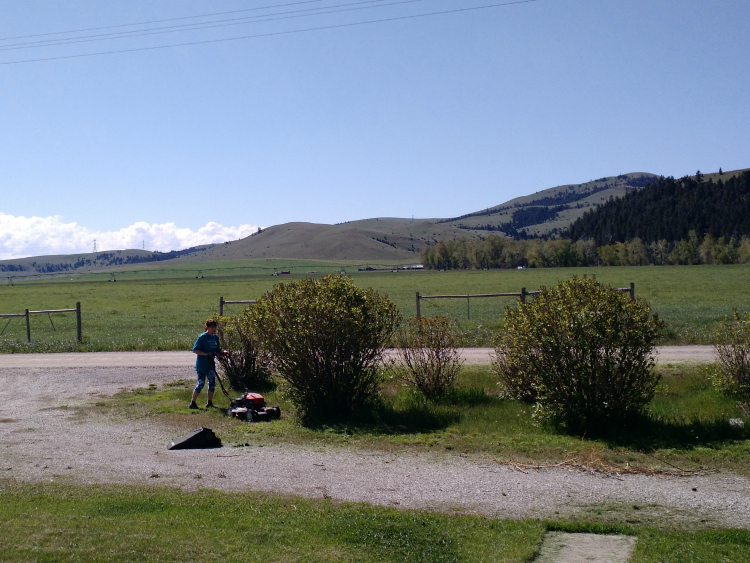 A couple of years ago we were watching a bunch of calves chasing each other around out there. Suddenly some mothers had had enough of it and aggressively made them stop! I could just imagine them fussing, "I had to make all that milk for you. Now, stop wasting it with all this sillyness!" In September, the rut begins all over again. And, so do I! I'm gonna do my best to be right in the middle of the elk rut in the mountains of Montana. In early September the gestation process starts all over again for elk, while the cows are still providing some non-critical milk for the 3 month old calves, along with preparing to survive another harsh winter. Where are the bulls right now? They're mostly up high, moving around very little as they feed constantly on green growing things spurred on just below snow melt. Some of that protein is being used up to grow new antlers, needed to win their opportunity to mate with some cows. Snow melt and fresh rain has provided lots of high-protein grasses that animals with multiple stomachs can convert into muscle. We hope to be hauling out well over a hundred pounds of that muscle from some bull elk that falls for my elk calling tricks this fall. We'll add it to to our freezer for our own winter stash of protein! My wife and I decided to celebrate this whole beautiful process on this (finally) warm Montana afternoon, with a hot grill and some elk meat! We hope you can do the same. But, first, I'm going to go do some fitness training for hunting in elk country. A four mile run that includes some hill drills and some hard hill repeat runs should do it for today. Get ready for hunting with some ideas on our Hunting Fitness page. 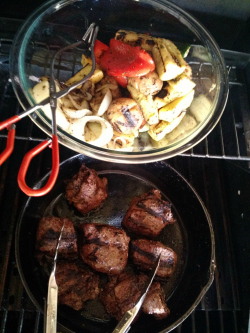 We decided on grilled Binghamton Speedies and grilled veggies. (I'm not a yankee. I'm from the south!) Essentially, it's an alternative to kabobs. Because, all the stuff on a skewer is hard to get done just right at the same time. Speedies is meat marinated in Italian seasoning (in this case homemade). Then grilled hot and fast just until the outside is nice and brown. 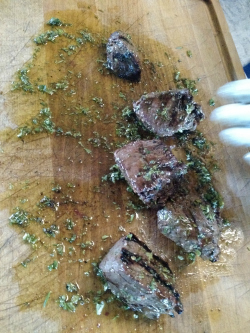 I sliced them up hot and rolled it around in a board sauce of olive oil and fresh herbs for extra flavor!